A pod coffee maker is a quick way to get your morning going. Switch on the machine, add fresh water, pop in a pod, and press start. In a minute or two, you have a piping hot cup of joe. Just don’t expect it to taste terrific. Because pod machines are about convenience, speed, and consistency, these are the qualities our testers focus on. We time brew speed for the all-important first cup and those that follow, note the temperature, record cup-size consistency, and evaluate convenience (operation and cleaning). Below, we review the best pod brewer for each major type of coffee pod, including Illy IperEspresso, Keurig K-Cups, Nescafé Dolce Gusto, Nespresso OriginalLine and VertuoLine, and Starbucks Verismo. CR members can click on each model name for more detailed ratings and reviews. To see other highly rated models, check our complete pod coffee maker ratings. If you’re concerned about the environmental impact of K-Cups and capsules, see our guide to recycling coffee pods. 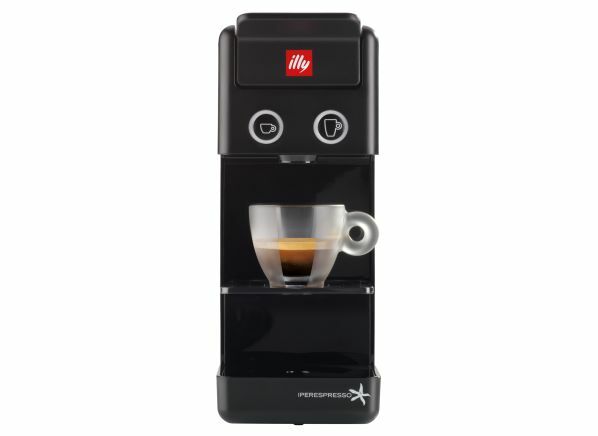 CR’s take: If you love Illy’s Italian coffee and prefer Illy IperEspresso capsules, the Illy Y3.2 Espresso/Coffee Machine 60296 is the brewer for you. In addition to its ability to brew coffee and espresso, this machine features a removable water reservoir, a brew-temperature adjustment, a height-adjustable drip tray, and auto-shutoff. It receives a rating of Excellent for repeat-cup speed (how quickly it can brew a second cup) in our tests, with superb temperature consistency as well. 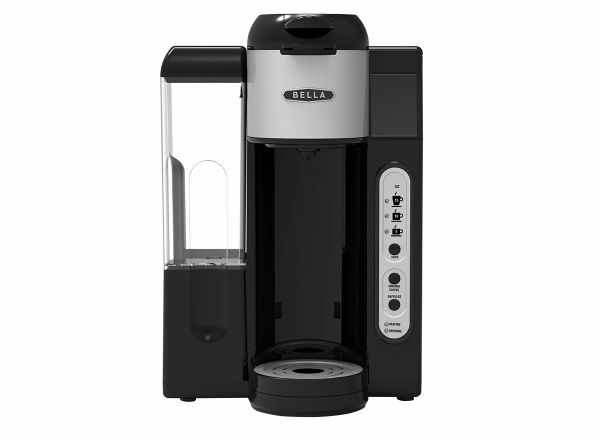 CR’s take: The Bella Single Serve With Water Tank BLA14585, which takes both Keurig K-Cups and loose grounds, receives a convenience rating of Excellent and offers great cup-size and temperature consistency. This machine features an auto-shutoff function, a removable water reservoir, and a height-adjustable drip tray, all wrapped up in a silver-and-black finish. And this Bella is an affordable choice, making it a CR Best Buy pick. 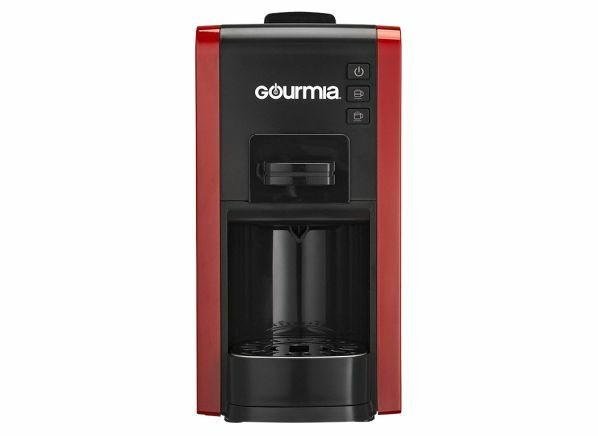 CR’s take: If you prefer Nescafé Dolce Gusto or Starbucks Verismo pods, consider the Gourmia Multi Capsule Espresso Coffee Machine GCM7000. 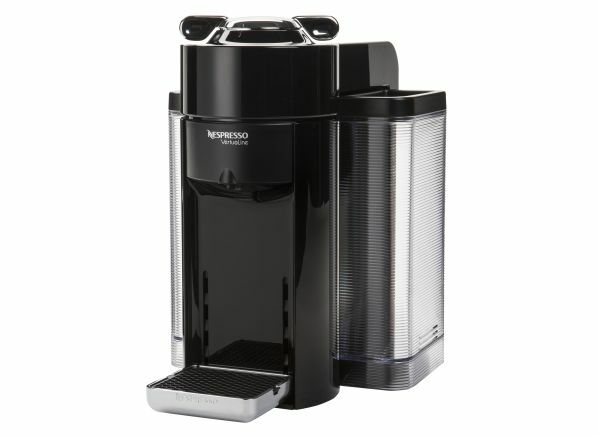 As the name suggests, this machine is versatile: It comes with adapters for multiple types of coffee pods, including Nescafé Dolce Gusto, Starbucks Verismo, K-Fee, and Nespresso OriginalLine. You can also use loose grounds, which gives you control over flavor. This Gourmia receives strong marks in just about all of CR’s performance tests, including an Excellent rating for repeat-cup speed. It comes in a red-and-black finish and features a removable water reservoir, an auto-off function, a height-adjustable drip tray, and adjustable brew temperature settings. CR’s take: If you’re looking for a Nespresso pod coffee maker that uses OriginalLine capsules, check out the Nespresso Pixie Espresso Maker in Aluminum EN125S. It earns high marks for first-cup speed, repeat-cup speed, and cup-size consistency. And it earns a rating of Very Good for brewing range rating, which means you have plenty of control over the strength of your brew. The Pixie has a removable water reservoir, a height-adjustable drip tray, and an adjustable brew temperature feature. It’s simple to use, and it can also brew three types of coffee—lungo (an Italian coffee), espresso, and ristretto (a more concentrated espresso)—depending on the capsules you buy. CR’s take: Prefer Nespresso’s VertuoLine capsules over the OriginalLine? 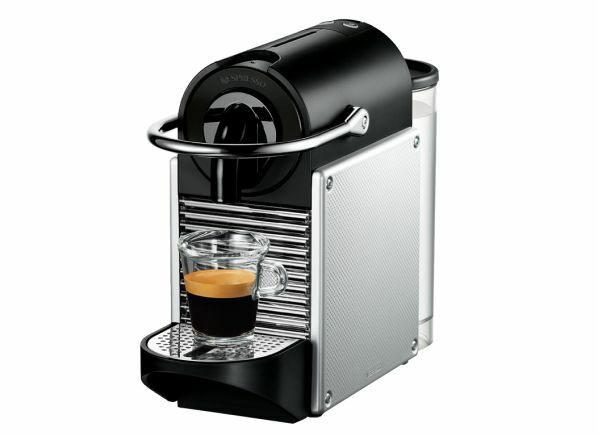 The Nespresso VertuoLine Evoluo Deluxe is the best VertuoLine model in our tests. It offers a superb brewing range as well as solid first-cup speed and cup-size consistency. And Nespresso machines earn a rating of Excellent for owner satisfaction in our surveys. In terms of features, this machine offers a removable water reservoir, a height-adjustable drip tray, and an auto-shutoff function. And the Evoluo Deluxe can brew both coffee and espresso, depending on the VertuoLine capsules you use.